As a guide, it should be possible to insert two fingers between the collar and the neck. Make sure the collar is not loose enough for the cat to put its leg through. Please carefully observe your dog when it’s wearing a collar for the first few days, especially when the pet is not used to wearing a collar. Try using a tasty treat, toy or other activities to distract your dog's attention from the new collar. Occasionally, slight itching may be observed in animals that are not used to wearing collars in the first few days of fitting. Ensure that the collar is not fitted too tightly. Slight hair loss and mild skin reactions due to the mechanical irritation of the collar may occur at the application site, which usually recover within a week or two without the need for collar removal. 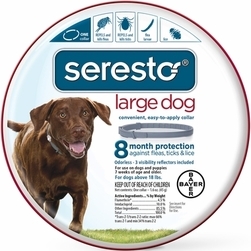 Get Seresto coupon. ​Keep collar in the bag and in the outer packaging until use. As with any pesticide product, do not allow small children to play with the collar or reflectors, or put them into their mouths. Avoid contact with eyes, skin or clothing. Wash thoroughly with soap and cold water after fitting the collar. People with sensitivity reactions to the ingredients of the collar should avoid contact with the collar. Chocking hazard. Contains small parts. Do not place collar or reflectors in mouth. Not intended for use on humans. 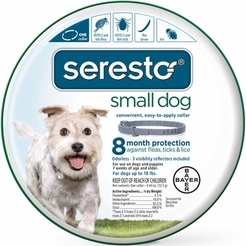 ​For external use on dogs or cats only. Do not use on other animals. Do not use on kittens under ten weeks of age or puppies under 7 weeks of age. Do not get this product in pet's eyes or mouth. As with any product, consult your veterinarian before using this product on debilitated, aged, breeding, pregnant, or nursing animals. Individual sensitivities, while rare, may occur after using ANY pesticide product for pets. If signs of sensitivity occur, remove collar and bathe you pet with mild soap and rinse with large amounts of water. If signs persist, or become more severe, consult a veterinarian immediately. If your animal is on medication, consult your veterinarian before using this or any other product. If your cat is experiencing an adverse event, contact your veterinarian. Learn more about Seresto's active ingredients. ​​All product and company names are trademarks™ or registered® trademarks of their respective holders. Use of them does not imply any affiliation with or endorsement by them.